How about spend a day away from Myeongdong to visit to Everland, Koreans' favourite theme park, to complete your vacation in Seoul. Everland 1-Day Pass with Bus Transfer from Myeongdong, Hongdae or Dongdaemun, Seoul. Everland offers lots of fun and adventures for everyone all year long through a wide range of themes from Global Fair, Magic Lan, American Adventure, European Adventure to Zootopia. Best of all, there is a shuttle bus service that will bring you direct from Myeongdong Seoul to Everland Resort. 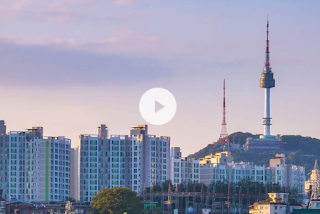 Most travel websites will recommend you to take Seoul Metropolitan Subway and train from Giheung Station to Jeondae Everland Station or to take bus 5002 or 5700 from Seoul to go to Everyland. However, none of these public transports start from Myeongdong. In this post, we will show you a special shuttle bus offered through Klook Travel in collaboration to Everland that will take you direct from Myeongdong Seoul to Everland. The trip time is only about 40-50 minutes. Unlike taking subway and train, you don't have to worry about changing train line. This shuttle bus service departs from the bus stop at EXIT 2 of Myeongdong Subway Station (In front of Hotel Prince) at 10.30am everyday. The location map of the bus stop is shown below. The Bus Stop for Shuttle Bus to Everland is located at EXIT 2, Myeongdong Subway Station, in front of Hotel Prince (as shown by the arrows). 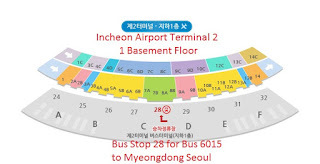 The round trip bus ticket fare for shuttle bus from Myeongdong Seoul to Everland and return to Myeongdong plus Everland One-day Pass ticket is 52,000 Won. However, this is not expensive considering it includes Everland One-day Pass ticket is 54,000 Won if you buy it directly at Everland. Klook Travel who offers this shuttle bus service from Myeongdong to Everland is able to get such discount on Everland One-day Pass because they buy for large group. In other words, those who follow this actually get Everland One-day Pass plus shuttle bus service from Myeongdong to Everland at a price cheaper than the original Everland One-day Pass price. Perhaps Klook Travel has been given a good deal by Everland for bringing so many visitor to their theme park. That is why they can sell Everland ticket at cheap price and including complimentary shuttle bus service as well. As there are only one bus a day, in order to get the shuttle bus plus Everland One-day Pass deal, you have to book your trip online as early as possible (at least two days) before your trip. In fact, the shuttle bus plus Everland One-day Pass package require advance booking and available for tourist (foreign passport holder only). As the shuttle bus ticket and Everland One-day Pass package include return trip, you can use the same shuttle bus service to return to Myeongdong Seoul after spending a day of fun at Everland. The returning bus will depart from Everland 15 minutes after Everland closing time at either 8pm, 9pm or 10pm depending on season. This make sure that you are able to enjoy the fireworks performance to end your Everland trip. Make sure you are on time and be there a little early. Keeping in mind Everland is a large place and you should give your ample of time to walk to the car park area to catch the bus. There will be many buses there to pick up tourists from different tour groups. Your tour guide will tell you exactly where the shuttle bus from Everland to Myeongdong will be parked at. Please note down the exact parking lot number and platform number your guide told you. In this post, we introduce the shuttle bus service offered by Klook Travel in collaboration with Everland that will bring you directly from Myeongdong to Everland. Of course, you can still choose to use the subway and train option, that is less convenient as you need to change train line etc. Best of all you can get your Everland ticket at a cheaper price and including a free round trip shuttle bus from Myeongdong Seoul to Everland and return if you book the trip online from Klook Travel (refer to booking section above). sorry asking why i cant call that no?or only can call when reach seoul? This is a Korea local phone number. If you call from overseas, you need to add country code for South Korea 82 in front. For example, in some countries you need to add + or 00 before 82 followed by the phone number without the first 0. Have a try. If doesn't work, you can still call them one day before the trip after you arrive in Korea. I have 30% discount voucher for Everland ticket. it is possible to use the discount voucher while using Desung Tour? It depends on which discount voucher you have for Everland. It is best to call Desung Tour before hand to check. Hi, may I know where is Desung Tour located at? Hi, may I know by calling Desung Tour to make the Everland entrance and shuttle bus ticket booking, how can I make payment to secure them? After you have made your bus booking by calling Daesung Tour, you can pay bus cash in the bus on the day of your visit to Everland. Have fun at Everland. Thanks for the information. Is accurate and extremely helpful! May i know if i book at korea, is it pay via cash on the spot for whole fees (everland ticket + shutter bus) or need to use Subway card to purchase? Cuz i dont have oversea credit card so it might be a problem if there is any changes last minute in korea. No problem. You can pay with cash for your shuttle bus and Everland ticket on the day when you board the bus from Myeongdong to Everland. Hi! How long is the trip back from Everland to Myeongdong? Thank you! The trip back from Everland to Myeongdong will take about 50 minutes, about the same as the trip going from Myeongdong to Everland. how to book this shuttle bus? can i book via email. do you have any email address? Booking can be done via phone. Just call them a day before your trip or earlier. Are seats on the bus guaranteed if we make a booking? My mum has leg problems and need to sit for the journey. Thanks! Yes, please make it clear you need a seat when you call to make booking. Everland is nice in December too. If you are lucky to get enough snow during your visit, don't miss the Snow Buster. The Safari is worth a visit too. Enjoy white Everland in December. Hi, I'm wondering if we can choose not to follow the bus back to myeongdong, since the part closes at 10pm. we can choose to stay throughout the day right? If so, how do we return back to myeongdong? Yes, you can. In that case, you have to consider taking train from Jeondae Everland Station back to Myeongdong station. The journey is quite long (about 2 hours) with 4 transfers of subway line in between before reaching Myeongdong station. Alternatively, you can also stay overnight at Everland and return on the next day with bus. Hi Chicken Share, good day to you! I would like to ask if how long is the trip from Myeongdong to Everland via the Daesung Shuttle Bus and vice-versa? We are planning of going to see the Banpo Rainbow Fountain after Everland. The trip time from Myeongdong Seoul to Everland using the Daesung Shuttle Bus is about 50 minutes. Hi, may i know when is the time of writing? Is there a chance daesung tour has changed their pricing? The round trip bus fare from Myeongdong to Everland is still 12,000Won. However, the Everland Admission Ticket promo by Daesung Tour is now priced at 35,000Won. Therefore, the total is 47,000Won. You can call them to check the latest promo price a few days before you visit. hi, but is is said above, if we uy admission ticket to everland in daesung agent, then bis fare is free. is that correct? Generally yes. They may change their promotion package from time to time. For example, recently they offer discount ticket+bus for 47000Won, which is even cheaper than the normal price of ticket alone 52000Won. Call them to find out latest promotion package. Hi, is there only one timing to return to Myeongdong which is 6.30pm? Is there any timing earlier than that? Yes, there is only one bus returning to Myeongdong from Everland if you are using Daeseong Tour. The time allocated is just nice for you to enjoy the theme park and return at 6.30pm. I hv bought the everland ticket in singapore,not knowing that u hv promo. Can I still pay the shuttle bus ticket? The promo is actually offered by Daeseong Tour. The round trip bus ticket from Myeongdong to Everland and return is 12,000won. You can call them at 032-322-7001 to check about the shuttle bus ticket to Everland without the Everland admission ticket. Do you have email address of Daeseong Tour could share with me? I am going Everland in December and hope to get more information before I set off. I do not have the email address of Daeseong Tour. You can try to call them at 032-322-7001 or try fax at 032-221-7163. Thank you so much for your prompt response. So far your webpage is one of the most useful and provide good tips for traveler. Keep it up the good work, I have introduce my friends to use your webpage for reference. Will the shuttle bus to Everland ever fully booked for December period? Will it be too risky if I call to make reservation one day in advance? can i call daesung tour when i reach korea? Is it too late for it? when we call, we just tell them to reserve how many tickets? And do we make the payment when we board the bus? Or through credit card? Yes, you can call Daesung tour one day before your trip between 9am to 6.30pm to make the booking and pay when you board the bus. Enjoy your time at Everland! hi ,i will go to everland on 19/12/2016 is it risky to call one day before because december is a peak season. is it only can pay cash for the ticket and shuttle bus when we on board in the bus? do we still need to queue up at the entrance of the ticket counter to exchange everland ticket? You can call a few days before your trip too. You can also make your booking for both shuttle bus and Everland tickets by phone. Currently they offer 33% discount on Everland tickets. If you reach Seoul, you should only call 032-322-709. If you want to call Daesung Tour from Malaysia, I believe you have to dial 00-82-32-322-709 or +82-32-322-709. Have a try. Hi there, our family of four (2 teens) will visit Seoul in Dec.30 for a week. We would like to visit Nami Island/Petite France/Garden of Morning Calm. There is Funtastic Korea Tour offers this trip but we don't know if it is safe to reserve online with them or do have any ideas? Thanks a lot in advance for your advise. Thanks so much for your prompt reply. Yes, prior reservation is required for Daesung shuttle bus from Myeong-dong to Everland. we are the local transpotation company. Hi, We are planning to stay until the fireworks which ends around 9pm is there a shuttle bus that caters until the park closes? Hi, I refer to your replied for the above. I would like to stay at Everland park till 9pm, hence would be only taking one way pickup transfer. How much will it cost for one way transfer with the park entrance admission fees with daesung? For the return transfer, could I take public bus everland for public bus a#5002 to Gangnam Station(Line 2)& train to Myeongdon station? Hello, would you happen to know how long it takes to get to Everland by Subway (Jeondae Everland Station) and by the city buses (assuming I left from Gangnam)? Everland ticket at 38,000 Won which include a free round trip ticket to Everland. Message from above. And do you know the updated price for ticket with round trip now ? We will go around 11 to 13 April 2017.